Once the Republican Gene can be identified, the Republican race can be eradicated. If so, Can you change 1 Dog Breed Progeny into Different type in the Future ? It is only then can laymen trust it (I am saying Laymen). Unnecessary. A III-Party Creation would do that. Can you Find out with Gene Editing, Why ALL Birds shove their Eggs underneath their Belly ? Try Sequential Gene Deletion to discover it. "We don't need the fetal body parts from babies to achieve scientific and medical achievements because we have alternatives that can do it," Rep. Jim Jordan said. Used to take a bunch of big expensive experiments to do stuff like this. Now you can do it in your basement. This is scary. But predictable. We can no longer afford nutjobs. It's time to start figuring out how to fix this unless you like horror stories. As if a mass shooting every week wasn't one. As if a mass shooting every week wasn't one. That's the price of the thoroughly corrupt Republican Party's political and financial support from the NRA. They will tell you it is the price of the 2nd Amendment. Of course if you are stupid enough to believe this is about the 2nd amendment, and not the money, you probably also believe every mass shooter and scumbag murderer are exactly what the Founding Fathers were hoping to protect when they wrote the 2nd Amendment to protect "a well-regulated militia." My interpretation of the 2nd Amndnt is based on actually reading the entire two paragraphs. Then putting it into context with the FF's original intentions. But then I have actually read the Federalist & Anti-Federalist Papers & James Madison's Notes. The 2nd is specifically to allow the individual States of the Union, the right to muster, arm, train & maintain organized Militia under State Command. This was already obsolete by the time of the War of Northern Aggression. As well as a slew of other amendments that have become obsolete by the Centennial. Instead of simply scrapping the old bird? Replacing it with a document that covers the issues important to this century & the next? We, The People, keep pretending the earlier versions of the US Constitution still have any relevance for modern life. Oh & Mark, that is not the NRA's money slipped to the GOP. The NRA is as effectively bankrupt of funds as of morals. All that money is surreptitious Russian & Saudi funding. Your interpretation is at least plausible. It says right there "[a] well regulated militia" and "being necessary to the security of a free state." I don't see how arming every idiot age 18 and older is going to accomplish that objective and in fact, it is clearly counterproductive to "the security of a free state." How are little to no regulations supposed to be the same as well-regulated? This can't be what the FF intended. About the surreptitious Russian & Saudi funding, it sounds like a crazy conspiracy theory, but I have to wonder what Maria Butina would think. "Maria Butina, the cofounder of the mysterious Russian gun-rights group called 'Right to Bear Arms' . . . "'took steps to develop relationships with American politicians.'" Yes, the FF's intended that each State was Sovereign within an all inclusive Federal structure. The Governors would reward political supporters with appointments as militia officers for each District & Unit. Then, during the Civil War, many of the appointee's, at best, were disappointing. Especially when they were commanding against Academy graduates or at least not total wash-outs. Which, to an nonredeemable cynic such as myself? Is why it is so damn hilarious when the self-righteous bombast of their patriotism & moral zeal. Don't know if you've noticed but "A Great Silence" has fallen on the fascists & their repunlican stooges? Hey! I claim dibs on "A Great Silence" for my next history book title. At the time the Bill of Rights was written, the nascent US was not going to be large and powerful as it is today; in those days, the US was going to be a small player on a rather large stage, and the Founders didn't want to stick the people with a bunch of taxes for an army. It would be over a hundred years before we started to gain the power we have today, and the colonists who were winning the Revolutionary War wanted to be a porcupine for any invading power. Do we need that today? Probably not. To get back to the original thread, it's not so much that gene editing has been made easy. It's that this technology (CRISPR etc.) enables anybody with a computer and a little knowledge of biological lab procedure to make any damn thing they can come up with. I'll quote William Gibson: the street finds its own uses for technology. The point is, what are the motives and goals of the users? And how do you find some nutjob making Captain Trips in his basement because jebus told him it's time for armageddon when he was listening to his rice krispies whisper? Now the Hypocrites of the Right attack every voice of reason. They deny the first paragraph of the 2nd Amt. Deny Citizens & Immigrants of Civil Rights & Human Dignity. They seek to delete the 1st Amt & the Emoluments Clause. These copperheads & quislings, as agents of foreign powers, have deliberately sabotaged the national, state & local voting system. I am so far too the left as I consider marxists to be right-wing fascist pigs. I actually feel sympathy for the hard-working, true patriots of the beleaguered agents of the FBI, CIA, DoD, DoS & other acronym gov agencies agencies. Struggling against the onslaught of the right/evangelist betrayal. I even feel sorry for John Kelly. Who, after a fine career serving his country. Has to retire in bitter defeat by the trumpsterfire crime family. Perhaps someone should whisper in Melania's ear? "Consider the fine example set by Edith Wilson as Acting President..."
My wife's reaction to the red xmas trees was classic. She had one word: "REDRUM"
I nearly laughed myself sick. Ha. 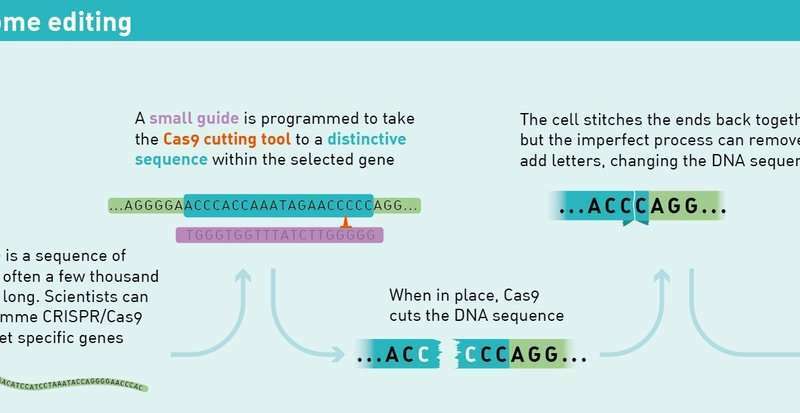 CRISPR/Cas is now truly "cutting edge" technology. What are you on about? CRISPR/Cas has many potential uses, but the article discuss the most promising, medical genome editing. It is not a tool for *massive change in an entire populations genome*, which is what evolution do. Nature has obviously always done that, and humans have done it with breeding. Go study evolution, if you somehow missed biology class, there are much study material on the internet say. Possibly, but I don't think CRISPR is the key technology, the ability to make the next plague has been there for a long time now. It is good to discuss risks, less good to attach undue scare to key technological advances. How many nuclear bombs have been dropped on people versus how many nuclear plants have we seen? How many chemical gas attacks have been levied on people versus how many tons of food has been saved by pesticides? Etcetera. @torbjorn, I can't find the quote you're referring to. Can you help? Did you mean "cutting edge" or "change ... Progeny" or insane gun owner joke 'quote'? The first is just quoting a common idiom, the later is abstracted from the second comment of the thread, the third is just me being tired after gym class so my funny bone is funny tickled. CRISPR-Cas9 is becoming a pre-requisite tool in genome editing market. The programmable capacity of the Cas9 enzyme is now transforming varied fields of medical research, industrial and animal biotechnology etc.